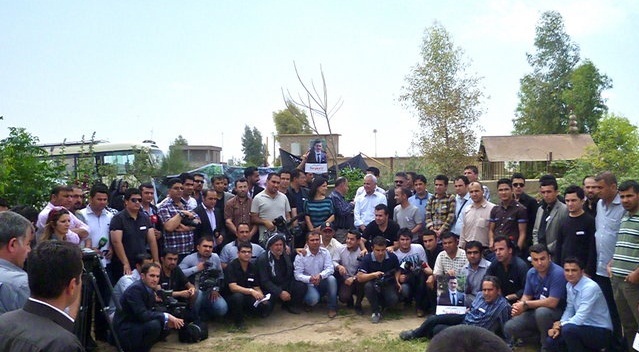 Saturday, 5 May marked the two-year anniversary of the murder of Kurdish journalist Sardasht Osman. CPTers traveled to Hawler (Erbil) to stand in solidarity with Osman’s family, friends and colleagues, as they remembered the young man. Osman, who was twenty-three at the time of his death, was in his final year at university in Hawler, and frequently published articles critical of the Kurdish Regional Government and prominent party leaders. On Saturday, CPTers, along with their partner Mohammed Salah, joined a crowd of about 150 people at the cemetery where Osman is buried. The media presence was significant as well - many present were Osman’s colleagues, and attended as an act of solidarity. After the ceremony, CPTers met with Osman’s father and older brother, as well as reporters, and CPTer Garland Robertson gave an interview for the Kurdish News Network (KNN). The procession to remember Osman was an intense moment to remember a young man and brave journalist but also a way for people to stand up for freedom of speech and press. A member of the Kurdish Parliament was also in attendance. Adnan Osman (unrelated to Sardasht) said that when they learned that a student from the university was killed two years ago, they had no idea he was also a journalist. “We lost a brave journalist that wanted to use his pen and write about the corruption and inform the society about how both the governmental parties are stealing money and oil,” Adnan Osman commented. Journalists and other press workers gather for a group photo op. According to Kurdish Metro Center, in 2010 journalists have been the target of 359 violations. Reporters Without Borders reports that in 2008, 23-year-old journalist Soran Mama-Hama, was gunned down in Kirkuk. Melinda Crowley, a diplomat from the US Consulate in Hawler, spoke at length about the importance of a free press within democratic societies, and instructed those listening that journalists should be encouraged to speak truth to power. CPT followed with a statement, delivered by Robertson and Salah and printed below, expressing dismay that such a seminar was necessary. Robertson and Salah also emphasized CPT’s concern about ongoing attacks on journalists within Iraqi Kurdistan. That evening, the Kurdish News Network (KNN) featured the anniversary of Osman’s death as its lead story, devoting over thirty minutes to their comprehensive report, including the entirety of CPT’s statement at the seminar, as well as coverage from the memorial at the cemetery earlier in the day.